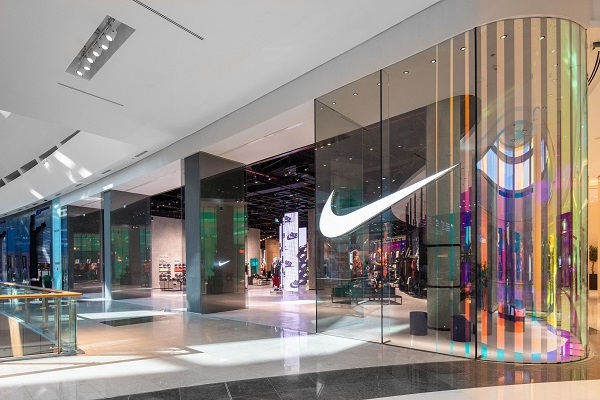 Nike has opened the doors of its brand-new store at The Dubai Mall in partnership with local distributor Sun and Sands Sports. Based near Beaverton, Oregon (US), Nike is the world's leading designer, marketer and distributor of authentic athletic footwear, apparel, equipment and accessories for a wide variety of sports and fitness activities. Sprawling across 3,290 sq m, Nike Dubai is the brand’s largest store in the Middle East and North Africa (Mena) region and it offers the best of Nike, from innovative products to services. The store serves as a platform for consumers to celebrate sports and collaborate through creative workshops. It has a customisation space that provides the opportunity to personalise Nike items all year round. Consumers are invited to design their sneakers and apparel with a variety of tools and accessories such as laces, straps, buttons, markers and tongue labels. With a revolutionary UV printing technology, consumers will also be able to print artwork on their fresh Nike sneakers said the statement from global sports company. The new outlet also boasts a women's salon. "Nike Dubai has an area that is designed specifically for women and encourages the female everyday athlete to get active. The salon features a distinctive spherical display of Nike’s footwear, carrying performance silhouettes as well as timeless streetwear classics," said a company spokesman. "It has a fitting room experience at its heart and features an intimate lounge area where women can hang out, play their own music and shop in full privacy along with their friends," he added. Drawing inspiration from the soul of the city, the new Dubai store will have a flexible trial space which has been designed as a small basketball court, inspiring Dubai youth to try out their new gear. For the store’s opening week, this space is designed as a Nike Maker’s Studio providing an exclusive Air Force “Hydro Dip” customisation experience, he stated. The store will drop the coolest products and for the opening week, this will include the iconic Nike HyperAdapt – the first fully functioning athletic shoe that electronically adjusts to the contours of the foot, providing a personal, customized fit," said the spokesman. According to him, a major highlight of the mega store will be community hub. "The store will serve as a platform for the local community to gather and connect with the city’s creatives and athletes. Nike Dubai will have a full agenda of sport and cultural events, varying from Nike+ Training Club and Nike+ Training Club sessions to athlete talks, artist sessions and stylist workshops,' he added. To celebrate the launch, Nike has planned an exciting agenda for the week. Starting from today (December 1), the global sports brand is inviting the city to get active and play through a variety of sports, customization and creative events, said the spokesman.